Why a focus on long-term unemployment? The number of long-term unemployed doubled between 2007 and 2014 and currently account for half of total unemployed in the EU. Long-term unemployment affects 12.1 million people (5% of the active EU population), 61% of whom have been out of work for more than two years. Addressing long-term unemployment is one of the key challenges of the jobs and growth agenda set out in President Juncker’s Political Guidelines and the Commission’s Annual Growth Survey 2015. Long-term unemployment is an acute problem because the longer people are out of work the more problematic it is to return. Data shows that the long-term unemployed, that is people who are out of work for over a year, have about twice as low chances of finding employment than the short-term unemployed. Many of those unemployed for a year or more risk leaving the labour market altogether. And each year, a fifth even stop trying to find a job and are classified as inactive. This trend needs to be reversed to ensure that the long-term unemployed can benefit from the economic recovery. Tackling long-term unemployment would contribute to sustainable growth and cohesion. It would reduce the impact of higher social assistance and lower tax revenues on public finances. It would also open a way out of poverty for both the workers affected and their families, as half of those finding a job also escape the risk of poverty. How is the situation of long-term unemployment in the Member States? The situation varies significantly across the Member States.In 2014, the long-term unemployment rate ranged from 1.5% in Austria and Sweden to almost a fifth of the total labour force in Greece (19.5%). 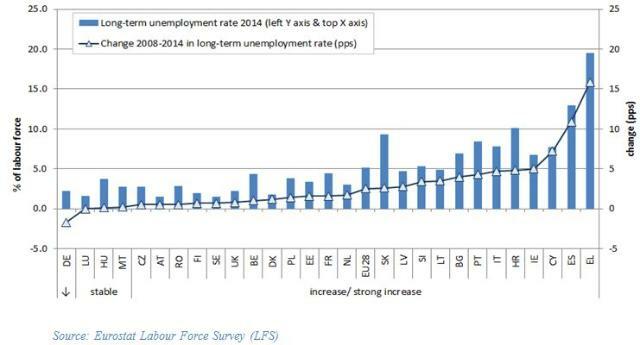 Who are the long-term unemployed in the EU today? Long-term unemployment affects a variety of people. Workers with low qualifications and third country nationals are twice as likely to experience long-term unemployment, while people with disabilities and disadvantaged minorities such as the Roma are also disproportionately affected. Long-term unemployment is three times higher among low qualified workers than among those with high qualifications. It affects slightly more men (54%) than women (46%). The age distribution of the long-term unemployed is quite even, with slightly higher rates before 30 and after 55. Older workers have more stable employment and are overall less affected by unemployment. However, when they become unemployed, they have higher risk to remain so. The diversity of situations requires support tailored to the needs of each person. This requires a differentiated approach and a broad tool box matching the individual barriers to work. What are the main obstacles to labour market integration of the long-term unemployed? On the one hand, they are due to structural and cyclical elements such asa lack of investment limiting job creation and a lack of responsiveness in the labour market. On the other hand, they are related to insufficient support to help the long-term unemployed get back to work. Insufficient activation coverage: Although long-term unemployed people make up 50% of unemployment, only an estimated 20% of active labour market programmes are allocated to them. In addition, many long-term unemployed people are not registered with employment services, with rates reaching 50% in some Member States, and have therefore no access to any job finding support measures. Wrong focus of long-term unemployment programmes and insufficient employers' engagement: In many countries, programmes are not focusing enough on bringing people back to the labour market and they are not geared to employers’ needs. In some countries the focus lies on public works schemes (about 31 % of current spending on active labour market measures for the long-term unemployed in 2012), which do not always open pathways back to the labour market. Limits of individualised service: Individualised services such as assessment, profiling or clear action plans are not always accessible to the long-term unemployed. Discontinuity of services to the long-term unemployed: during the unemployment period, long-term unemployed see the support they receive shifting from public employment services to social assistance authorities. When responsibilities are not clearly allocated between agencies, case histories might not be transferred and coordination of services is limited. These discontinuities can delay an effective support for return to work. The structural barriers to integration are also addressed through other existing and new instruments such as the European Semester, a forthcoming Commission skills initiative and the European Fund for Strategic Investments (EFSI). Which results do we expect from the Recommendation? The key result expected is an increase in the transition rates from long-term unemployment to employment by making the services provided to the long-term unemployed more effective, in particular in the Member States with higher numbers of long-term unemployed and less support available to them. It should help to reduce the gaps in current transition rates between the low performing Member States and well performing ones. Long-term unemployment is one of the most significant causes of poverty. Chances to exit poverty are linked to the chances of successful transitions to employment. Half of the long-term unemployed who will take a job are expected to escape the risk of poverty. Create a stronger link between benefits and activation. More employers will engage in programmes targeting long-term unemployed. While the Recommendation can make a difference in the quality, accessibility and relevance of the support received by those who are long-term unemployed, it is no substitute for macroeconomic instruments to solve structural issues on the labour market. In which countries will the Recommendation make more of a difference? Some Member States with high transition rates to employment already have in place the elements proposed in the Recommendation. The impact will be higher in Member States with weaker support structures and higher rates of long-term unemployment. However, there is scope in most of the Member States for improving the performance of the support for long-term unemployed in the three aspects identified: coverage, discontinuity, and activation design. More continuity in support delivery: Impact would be higher in Member States with no formal coordination in place: Bulgaria, Cyprus, Greece, Spain, Croatia, Italy, Lithuania, Malta, Romania. Increased individualised support: Impact will be higher in Member States without individual approaches in place: Czech Republic, Croatia, Portugal, Romania, Cyprus, Greece, Spain, Italy, Latvia, Hungary. Are there good examples of concrete and positive results in countries already implementing a similar approach? The introduction of a single point of contact led to increased re-employment probabilities and people moving off benefits in the United Kingdom and faster job finding among the long-term unemployed in Germany, while improving the quality of occupational matches. In Germany, the “Berlin Job-Offensive” offered intensified counselling and guidance by reducing the number of cases handled by caseworkers and higher contact intervals with the jobseekers (every 4 weeks), increasing transitions to employment. Improved monitoring of job search activity and more credible threats of sanctions also increased transitions to employment in Germany, Denmark and Estonia. A pilot from Netherlands shows that intensified contacts focusing on rights and duties lead to higher job search intensity. Evidence from Germany, Netherlands, Sweden, Portugal and Denmark shows that lower caseloads and higher “contact intensity” have a positive impact. A model combining intensive support, caseworker discretion and monitoring of outcomes has a positive impact on both placement rates and on matching, lowering skills mismatches and increasing quality jobs for the long-term unemployed. Personalised interventions with employer involvement increase transitions to work for unemployed with longer duration, as shown by evidence from Austria and Sweden. A scheme in Germany for jobseekers aged over 50 that included counselling and training based on close cooperation between local public authorities, service providers and employers also registered positive re-employment effects. How do you expect people to be encouraged to register? Registration of the long-term unemployed with public employment services (PES) decreased slightly from 77 % to 73% during the crisis and the registration rates vary widely among Member States. In several Member States, this rate is below 50%. The long-term unemployed that are not registered with a PES have no access to job finding support measures. A single point of contact, where they can access all services, measures and benefits. What do you mean by assessment of the long-term unemployed? As integration problems are due to multiple factors, the long-term unemployed require individualised support tailored to their needs and potential. To design this support, an in-depth assessment of the individual situation is necessary. The Recommendation proposes to put in place an in-depth individual assessment for each registered long-term unemployed at the latest at 18 months of unemployment. The assessment should include a skills audit and lead to counselling and guidance based on the person’s employment track, job search history and evolving employment barriers. The results of the assessment should form the basis for designing the job integration agreement. An assessment at the latest at 18 months of unemployment does not preclude individual assessments at earlier stages of the unemployment spell. What is a job integration agreement? The job integration agreement is a written agreement between the unemployed person and a single point of contact offering a plan for return to work at the latest at 18 months of unemployment and registered at an employment service. It will detail the services offered by different organisations responding to the jobseekers needs and will spell out mutual rights and obligations both for the beneficiary and the organisations involved. The interventions offered in the agreement will be tailored to the needs of the individual as identified in the in-depth individual assessment and will be built on measures available at national level (job search assistance, training, work experience, mentoring, debt counselling, rehabilitation, child and health care services, migrant integration support, housing and transport support). It will be offered to all long-term unemployed outside the remit of the Youth Guarantee. Why is it signed at 18 months of unemployment? Looking at transition rates from unemployment into employment, it is possible to observe a large drop between 12 and 24 months of unemployment. 18 months has therefore been chosen as a relevant timing for intervening to reverse this trend. Most Member States offering interventions similar to the one proposed in the Recommendation act within that same period. What is a single point of contact? The single point of contact should be the reference point for the long-term unemployed and provide them with guidance and simplified access to benefits, employment and support services through the personal contact with a single individual counsellor. Member States should set up institutional arrangements so that a coordinated range of services can be delivered to the long-term unemployed to ensure continuity and consistency of the support offered by different agencies (public employment services, social services and municipalities). It should facilitate the smooth and secure transmission of relevant information concerning jobseekers’ support history and individual assessments between service providers, in compliance with data protection legislation. Establishing a single point of contact can be achieved in different ways. It can involve a wider organisational restructuring such as joining up contact with clients, integrating offices or the transfer of organisational functions between agencies. But it can also be set up through inter-institutional cooperation, based on cross-referrals and data exchange. The experience of countries that established single points of contact confirms its positive effect on extension of both registration and coverage of employment services (for example United Kingdom, Germany, Denmark and Estonia). How shall the Member States finance the implementation of the recommendation? Implementation can be supported by the European Social Fund (ESF). Measures under the European Regional Development Fund (ERDF) could also be mobilised to support the objectives of the initiative (e.g. investments in infrastructure for employment services, or support for self-employment and start-ups). Proactive programme management through existing mechanisms foreseen by the Common Provisions, European Social Fund and European Regional Development Fund Regulations (e.g. reallocating funds within a priority axis, aligning programming and project selection criteria) could support the efforts of Member States. In addition, any Member State wishing to provide additional funding to implement a new Country Specific Recommendation on long-term unemployment could address a re-programming request to the Commission. How can the European Social Fund (ESF) support the implementation of the Recommendation? The Recommendation will serve as a quality reference for ESF interventions under the current programming. It will improve the allocation of ESF funds and its effectiveness. It thus complements and reinforces the ESF interventions. 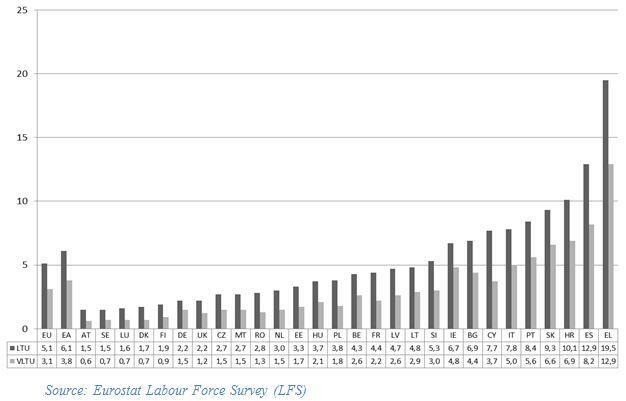 On the basis of current programming for 2014-2020, the unemployed will constitute at least 41% of the allocations supported by the ESF, and at least 25% of these will be for the long-term unemployed. The 2014-2020 ESF allocations allow room to increase the financing of support to long-term unemployment and to enhance its efficiency. Under the investment priority on active labour market measures, 11.08 billion euros were programmed for 2014-2020, with particularly high shares in Slovakia, Finland and Ireland. Under the investment priority on increasing the capacity of labour market actors, 980 million were programmed, with higher allocations in Italy and Romania. 12.9 billion euros were programmed under the social inclusion priority, with higher shares in Netherlands, France, Ireland and Belgium. Additional funds have been programmed under the European Regional Development Fund for investment in employment services and social infrastructure. What is the relation between the new initiative and the Youth Guarantee? The Youth Guarantee (YG) was established by the Council in 2013 to address high levels of youth unemployment and inactivity resulting from the crisis and to improve school to work transitions. It aims to provide every person up to 25 years old with a quality offer for training, an apprenticeship or a job within four months of leaving education or being unemployed. This recommendation follows an approach similar to the one of the YG, proposing an intervention model based on an individual, coordinated offer, but it targets those outside the scope of the YG. The two initiatives are therefore fully complementary. Most Public Employment Services (PES) recognise a significant impact of the YG initiative on their delivery capacity. By proposing a clear framework for citizen relevant action, the Youth Guarantee prompted public administrations to deliver additional services for young people. How will the EU check whether the Recommendation is followed by the Member States? To monitor the implementation of the Recommendation, a set of indicators and guidelines for evaluating its progress, including a reporting mechanism, will be agreed within the Employment Committee. Monitoring would be partly based on existing indicators in the Joint Assessment Framework of the European Employment Strategy and in the PES Benchlearning process. Additional data would be collected through the delivery organisations (mainly the PES) in line with current Member States practice. The effectiveness of the initiative will be monitored against the specific objectives defined, which relate e.g. to the share of long-term unemployed that are supported and the share that move to employment afterwards. The effectiveness of the initiative will be further assessed by an evaluation of the action taken in response to this Recommendation, and report to the Council. When is the Recommendation expected to be adopted? The Commission's proposal will be discussed in the Council, under the Luxembourg presidency. Once Member States agree, the measures foreseen in the Recommendation are expected to be rolled out. The long-term unemployment rate is the share of unemployed persons since 12 months or more in the total number of active persons in the labour market. Active persons are those who are either employed or unemployed. The very long-term unemployment rate is the share of the unemployed persons since 24 months or more in the total number of active persons in the labour market. Minimal estimate on the basis of the MS having chosen to set targets for the long-term unemployed. The share will most likely be higher, as it is not an obligation to programme for all common indicators.